#1 Hole- 345 yds. par 4- The opening hole is a short dogleg right, a pond separates the end of the fairway and the green making your tee shot placement a premium. A large two tier green is receptive to your second shot. #2 Hole- 195 yds. par 3- A very difficult par three, the green is guarded by a pond on the left and a bunker on the right. The prevailing wind blows towards the water so take your three and go to the next tee. #3 Hole- 500 yds. par 5- A dogleg right par five where your tee ball must carry a creek approximately 200 yds. away. This par five is reachable in two shots and offers up a good chance for a birdie, but beware this green is not an automatic two putt. #4 Hole- 415 yds. par 4- A long dogleg left, the fourth hole deserves it’s number 3 handicap ranking. The fairway is flanked by woods, water and out of bounds to the left and a strategically located strand of willow trees to the right. A creek runs across the fairway 285 yds. off the tee. The second shot is uphill to a large green. #5 Hole- 405 yds. par 4- The number one handicap hole requires the use of all parts of your game. A dogleg right, the tee shot requires placement based on the pin position. 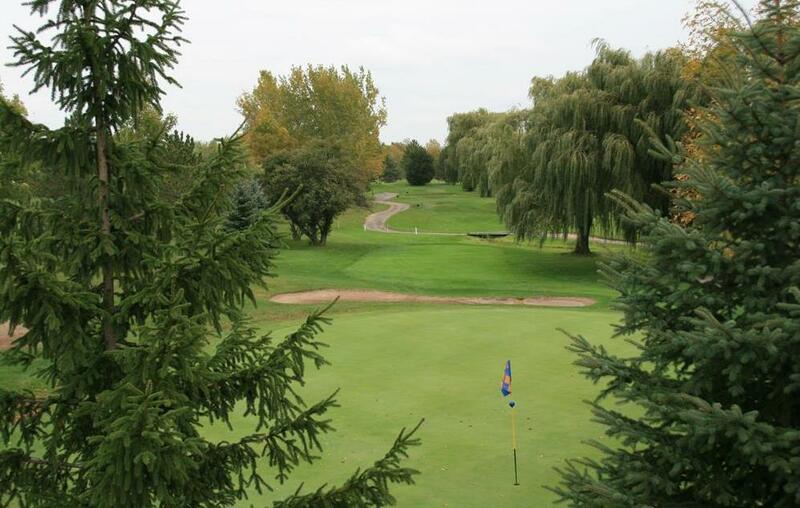 A second shot from the left side of the fairway can be blind, while a second shot from the right side of the fairway must carry over a group of willow trees. 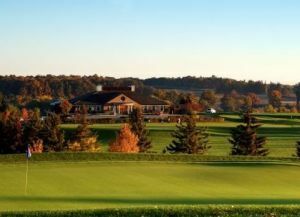 The long undulating green is nestled between a creek to the left and a tree lined hill to the right and heaven forbid but four putts here are not uncommon. #6 Hole- 345 yds. par 4- The sixth hole offers a little relief form the demands of the last two, however do not let up too much. The tee shot must be positioned to avoid a pond that guards the front of the green. Most players lay up with a long iron or fairway wood which leaves a short iron into the green. #7 Hole- 365 yds. par 4- A sharp dogleg left does allow the long hitters to cut the corner, but position is more important than length. The second shot is to a very small trapped green that can be difficult to hold. #8 Hole- 510 yds. par 5- A long straight away par five requires a lay up second shot as the green is affronted by a wide pond. The key is the third shot over the aqua which has been known to swallow many a ball. #9 Hole- 210 yds. 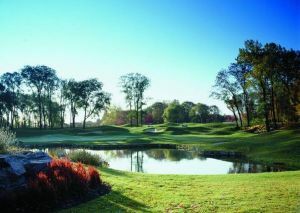 par 3- The finishing hole on the front nine is the most demanding par three on the course. Usually into the prevailing wind, it requires a long iron or fairway wood to a green that is guarded by a front right bunker and water on the left. Three is a very good score on this brute. #10 Hole- 385 yds. par 4- Like the front nine, the back nine starts out rather passively with a hole that features a rolling fairway and elevated green. Take enough club on your approach shot and you should find success. #11 Hole- 194 yds. par 3- Back into the prevailing wind, this shot is all carry to a undulating green. Well trapped in front, your tee shot must be placed for an uphill putt to give yourself a legitimate birdie putt. #12 Hole- 570 yds. 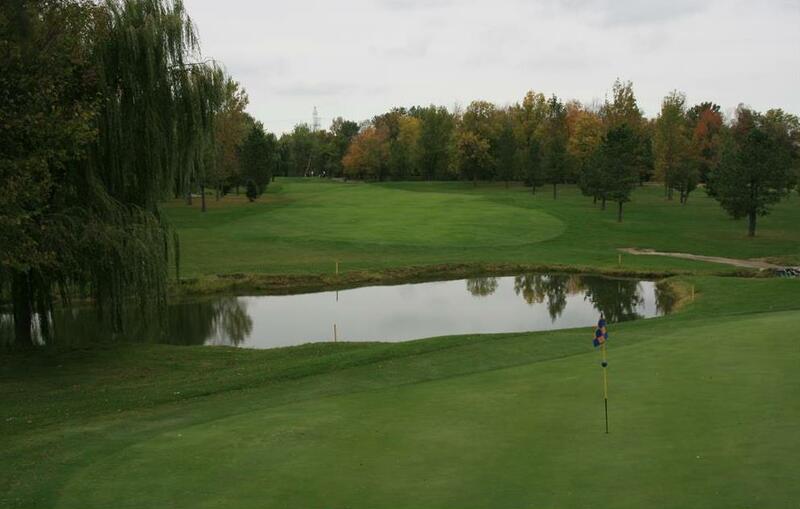 par 5- A wonderful double dogleg hole that is a true test of all your skills. Three solids shots are a must to reach this green in regulation. The tee ball must avoid a small stream on the left, before the creek reverses to the right side for the second shot. An uphill third shot makes club selection difficult to a shallow green that is well bunkered. #13 Hole- 158 yds. par 3- A short hole, the green is two tiered which makes for some great pin positions. Guarded by a trap on the left and water to the right it requires a pin point shot to score well. #14 Hole- 495 yds. par 5- A great risk reward hole. Doglegged to the left, this hole is reachable in two shots but requires flirting with the out of bounds on the dogleg. A pushed tee shot will find Ray’s Creek winding its way down the entire right side of the fairway. The normal third shot approach is uphill to a shallow green that does require precision to get the ball close. #15 Hole- 520 yds. 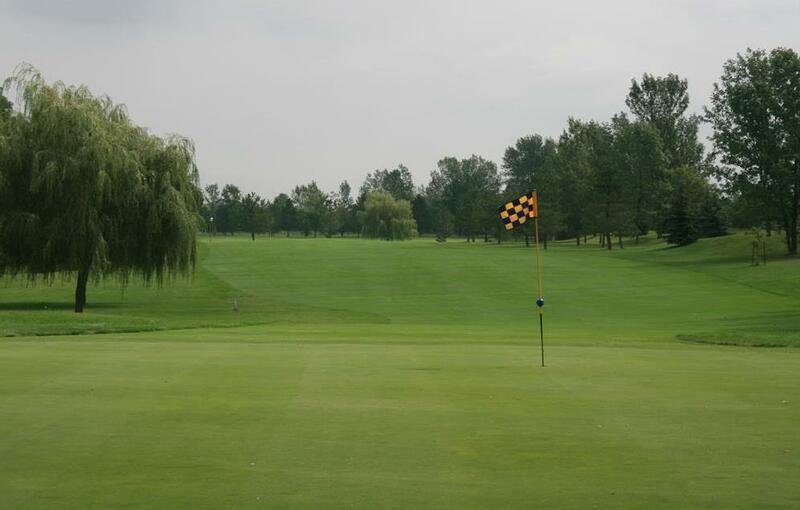 par 5- The start of the Beechwood Triangle, this par five is one of our signature holes. A narrow tree lined fairway requires accuracy on all shots. After negotiating the tee shot it does not get any easier as the second shot must be in the fairway to allow a third shot into a very small elevated green. There is simply no easy way to play this hole. #16 Hole- 385 yds. par 4- This sharp dogleg right features a blind tee shot that must be positioned accurately. Shots lost right will be in the woods and out of bounds to the left is no bargain either. 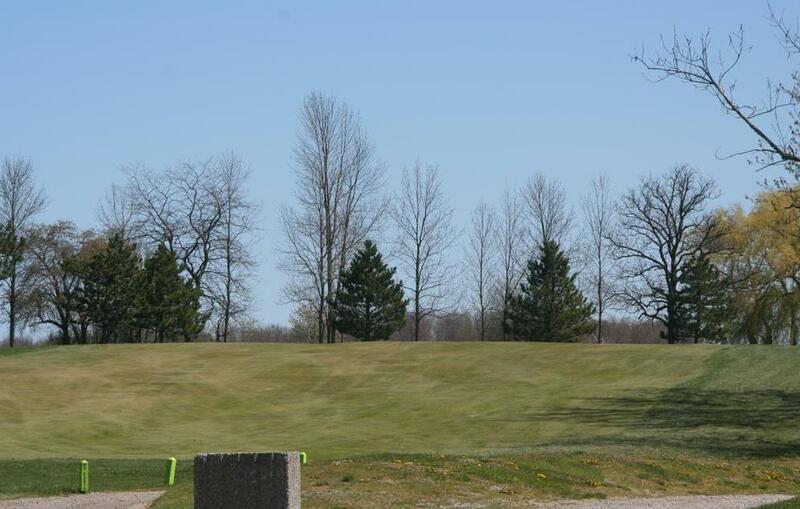 The green is situated behind a small creek with a bunker left and more of the creek swinging behind it to the right. One bad shot on this hole can lead to three or four more on the scorecard. #17 Hole- 153 yds. par 3- The shortest par three presents only one viable option- hit the green! Water to the front and left, marsh to the rear, bunker and trees to the right- there is no room for error! #18 Hole- 410 yds. par 4- The finishing hole is a beauty. A pinpoint drive between out of bounds on the left and a creek to the right that cuts into the landing area. The second shot requires a surgical touch to a three tiered green that slopes to the creeks edge. Even a poor putt can find a watery grave. If you are enjoying a good round score wise, there is no dishonour in playing for a bogey here! 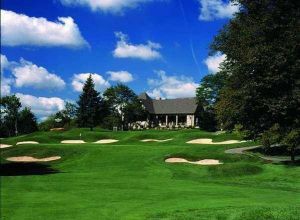 Beechwood Golf & Country Club is not yet in our pool of Golf Courses for orders.